Load moving skates are mechanical handling equipment used to transport heavy machinery and other items in the work area. Machinery moving skates is very useful for short variable transportation distances. 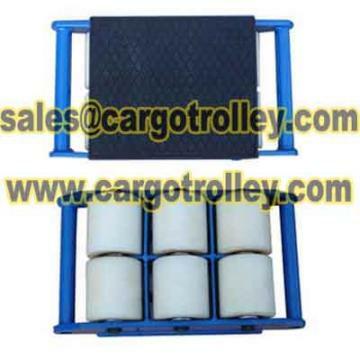 Is best ideal for installation works and movement of heavy loads or objects. Shan Dong Finer Lifting Tools co.,LTD was established in the year of 1993,has more than 20 years professional manufacture experience on all kinds of lifting tools. Aimed at the domestic and international market,take the key technology of moving and lifting tools, is the leading moving tools manufacturer in China Our products has been export to Middle East, America,Africa, Europe and other global market. Cargo trolley can be steerable, and can be just go straight, when moving your equipment, please according your floor and requirement to sel ect the moving load skates. Moving rigger skates can be worksed as a permanet installation on board an oil rig.